KP cells (A) and A549 cells (B) were treated with increasing doses of ATN-224 alone or with the BCL2 inhibitor ABT-263, and cell death (96 hours) was determined. (a) H23 cells exposed for 0–24 h to TW-37 (10 uM) with and without ZVAD.fmk (50 uM) were monitored for apoptotic morphology using electron microscopy (scale bar, 5 mm). % PS positive cells indicate the percentage of apoptotic cells, characterised by PS externalisation. (C) OCI-AML2 cells were cultured for 1 day with or without the indicated doses of CB-839 and ABT-199; apoptosis was evaluated based on Annexin V staining. (D) MOLM-14 cells were cultured for 1 day with or without the indicated doses of CB-839 and ABT-199; apoptosis was evaluated based on Annexin-V staining. Histograms show data that are representative of 3 independent experiments. The response of the combination was compared with its single agents against the widely used Loewe model for drug-with-itself dose additivity using Chalice software26 and presented as an isobologram. *P < .05, **P < .01, ***P < .001. The cellular autophagy induced by the concentration of AT101 (5 μM) and APE1 siRNA was examined by confocal microscopy with the application of Cyto-IDr autophagy detection kit. ABT-737, Obatoclax, and HA14-1 eradicated the H1975 early tumor prosurvival resistance against dual-TKIs inhibition by erlotinib/SU11274 (ERL/SU). The experiment was carried out with H1975 cells , cells were pretreated with dual EGFR-MET inhibitors here, i.e., erlotinib (1 μmol/L)/SU11274 (1 μmol/L). BH3-mimetic used in treatment days 7-9 were all 2 μmol/L in concentration. Top, crystal violet cell survival staining assay. Bottom, BH3-mimetic treatment of the dual ERL/SU-resistant tumor cells induced a proapoptotic response. (e) Abs (490 nm) was measured by MTS assay in siControl or siPTBP1 treated PC3 cells with DMSO, 1000 nM ABT737, or 100 nM Sabutoclax for 48 h, showing no significant change in cell viability following siPTBP1 treatment in DMSO control, ABT737, or Sabutoclax treated cells. (f) PC3 cells transfected with siControl or a mixture of two siPTBP1 were treated with 1000 nM ABT737 or 100 nM Sabutoclax combined with various doses of docetaxel for 48 h and cell viability was assessed by MTS assay. The viability of cells with 1000 nM ABT737 or 100 nM Sabutoclax alone was set as 100%. All data are presented as mean±S.E.M., n=3. The statistical significance was determined by unpaired student t-test where *P<0.05; **P<0.01; ***P<0.001. 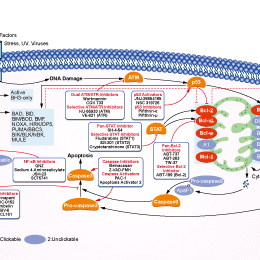 U251 glioblastoma (F) or MeWo melanoma (G) cells were treated with selective BH-3 mimetics, GTPP or the combination of both for 24 h (U251) or 48 h (MeWo). Thereafter, cells were stained with annexin V and propidium iodide and analyzed by flow cytometry. Shown are representative flow plots. Tumor growth rate (TGR) of tumors orthotopically implanted in rats on day 3, 7 and 10 compared to day 0. Rats were treated with doxorubicin, A-1155463 or a combination. Treatment with A-1155463 resulted in a significant decrease in TGR compared to control mice. Cells were treated with 0.5 μM A-1331852 and 1.5 nM VCR (RD), 0.5 nM VCR (RH30) for 72 h. Apoptosis was determined by analysis of DNA fragmentation of PI-stained nuclei using flow cytometry. Mean and SD of three independent experiments performed in triplicate are shown; **P < 0.01. In vivo antitumor efﬁcacies of AZD2281 and GX15-070 alone or in combination in a BxPC-3 xenograft model. Tumor specimens were fixed in 10% formalin, embedded in paraffin, and cut into 4 lm-thick slides for H&E, PCNA, and CD34 staining.